We spruced up our living room with a springy lampshade makeover. 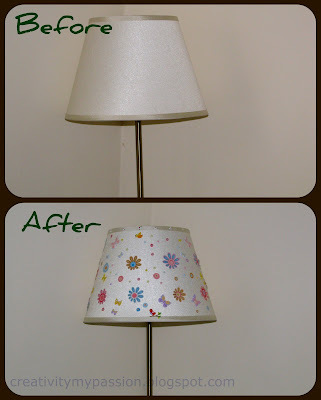 This lampshade makeover is really quite simple and just takes 10 minutes time. We used Sticko stickers. It looks so much more fun now! So whimsical, cheerful and perfect for Spring, Esther! It's always such a pleasure to have you be a part of "A Little Birdie Told Me..." at Rook No. 17! Simply beautiful..loved the idea..amazing how you come up with gorgeous makeovers using simple techniques. Thanks for linking in our carnival. Hugs and kisses to the little pretty hands in work.